Saturated with fabric, from finely spun silk and brocade to dirty rags, this 1974 production is a battle between passion and poverty. As Manon tragically learns, you can't have both. Why See American Ballet Theatre - Manon? The portrayal of a young woman torn between love and riches and the tragedy it brings to her and her lover have made Kenneth MacMillan's ballet a world-wide success. The ballet is inspired by the novel Manon Lescaut (which has also given rise to an opera of the same name) and is set to a score by Jules Massenet. The captivating story takes us from decadent Parisian salons, where two young lovers meet (including our beautiful heroine Manon), to the much wilder swamps of New Orleans, where they are later exiled after a violent brawl involving Manon's lover, her brother, and the man who paid a high price to buy her affections. Manon is an engrossing ballet though one not for the faint-hearted, with its dramatic tale of bought love, revenge and murder. May not be suitable for younger audiences. Children should be at least six years old to attend ABT performances at the Met. 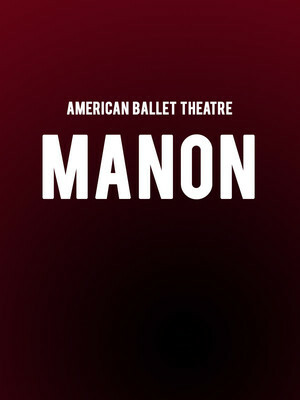 Seen American Ballet Theatre - Manon? Loved it? Hated it? Sound good to you? Share this page on social media and let your friends know about American Ballet Theatre - Manon at Metropolitan Opera House. Please note: The term Metropolitan Opera House and/or American Ballet Theatre - Manon as well as all associated graphics, logos, and/or other trademarks, tradenames or copyrights are the property of the Metropolitan Opera House and/or American Ballet Theatre - Manon and are used herein for factual descriptive purposes only. We are in no way associated with or authorized by the Metropolitan Opera House and/or American Ballet Theatre - Manon and neither that entity nor any of its affiliates have licensed or endorsed us to sell tickets, goods and or services in conjunction with their events.